The links in this section are to external web sites. Universal Leonardo is not responsible for the content or reliability of the linked websites and does not necessarily endorse the views expressed within them. Biblioteca Ambrosiana - Atlantic Code - Digitised version of the Atlantic Code with an introduction to the history of the manuscript and brief description of each page. In Italian. Biblioteca Ambrosiana – Catalogue of drawings - An inventory-catalogue of some 12,000 drawings by European artists who were active from the 14th through to the 19th centuries. Biblioteca Nacional de España - The Codex Madrid I and II were found in 1966 and are kept at the Biblioteca Nacional, Madrid. Biblioteca Reale - The Codex on the Flight of Birds and other drawings by Leonardo, including his self- portrait, are preserved at the Biblioteca Reale, Turin. Biblioteca Vaticana - The Biblioteca Vaticana houses the Codex Urbinas. Bibliothèque de l’Institut de France - The Bibliothèque preserves Leonardo’s Paris Manuscripts as well as the Ashburham Code. Bibliothèque Nationale de France - The Bibliothèque houses a number of Leonardo’s drawings including figure studies for the Adoration of the Magi. British Library - Users can “turn the pages” of the online version of the Arundel Code kept in the Library. There is a text and audio commentary for each page, as well as a mirror writing reading tool and magnifying glass. Alte Pinakotheke - Leonardo’s Madonna of the Carnation is held at the Alte Pinakothek, Münich. Ashmolean Museum - Some of Leonardo’s drawings are held at the Ashmolean Museum, Oxford. British Museum - Compass - The British Museum’s collection of about 5000 digital objects includes some of the drawings by Leonardo held at the Museum. Castello Sforzesco - In the Castello Sforzesco, Milan, survives a mural painting by Leonardo in the Sala delle Asse. The Biblioteca Trivulziana, where the Codx Trivulzianus is kept, is also part of the Castello Sforzesco. Czartoryski Museum - The Portrait of Cecilia Gallerani (The Lady with the Ermine) belongs to the Czartoryski Museum, Cracow. The site provides interesting information on how the painting made its way to the museum. Galleria degli Uffizi - The Uffizi house Leonardo’s Annunciation, The Baptism of Christ and the Adoration of the Magi as well as many other important drawings by the master. Gallerie dell’Accademia - The Gallerie dell’Accademia, Venice, contain important collections of 14th-18th centuries Venetian paintings as well as a number of drawings by Leonardo. Musée du Louvre - The Musée du Louvre holds Leonardo’s masterpiece, the Mona Lisa, as well as other paintings and drawings by the artist. Musei Vaticani - St Jerome is held at the Pinacoteca Vaticana, part of the Musei Vaticani, Rome. On this site, one can visualise high resolution details of the painting. National Gallery of Art, Washington - The Gallery houses the Portrait of Ginevra de’ Benci. Additional information about the painting includes a bibliography and its provenance and exhibition history. National Gallery, London - One of the two versions of the Virgin of the Rocks and Tobias and the Angel are both held at the National Gallery, London. Royal Collection - The Royal Collection, Windsor, houses a collection of over 600 drawings by Leonardo including his anatomical studies. Santa Maria delle Grazie - The convent of Santa Maria delle Grazie, Milan, houses the Last Supper. The site provides background information about the painting, its last restoration and a bibliography. State Hermitage Museum - Both the Madonna and Child (Benois Madonna) and the Madonna and Child (Madonna Litta) are part of the collection of the Hermitage Museum, St Petersburg. Szépmûvészeti Muzeum - The Budapest Museum of Fine Arts displays Leonardo’s Equestrian statue and also possesses some of his drawings. Victoria and Albert Museum - The V&A houses Leonardo’s Forster Code, three bound volumes containing five notebooks. BBCi and Open University - Based on the BBC/OU Leonardo series, it offers expert essays on Leonardo’s art, architecture, engineering, and his social legacy as well as a timeline of Leonardo’s life. Bibliografia Internazionale Leonardiana - A searchable bibliography on the works by and about Leonardo da Vinci published in the whole world. In Italian. Drawings of Leonardo da Vinci - A selection of drawings by Leonardo with minimal information on them. Giorgio Vasari: Life of Leonardo - Leonardo's biography written by Antonio Vasari in his "Lives of the Most Eminent Italian Architects, Painters, and Sculptors" first published in 1550. Leoanrdo da Vinci. Master Draftsman - The web site accompanying the Metropolitan Museum of Art’s exhibition on Leonardo. It contains essays and a bibliography from the catalogue as well as images of the works exhibited. Leonardo da Vinci - A virtual journey through Leonardo’s life, including sections on the Mona Lisa’s smile, the bicycle and Leonardo’s family tree. Leonardo da Vinci - An in-depth article on Leonardo's life by Frak Zöllner. Leonardo da Vinci Museum - A virtual gallery of images of Leonardo's paintings and drawings as well as information relating to his life and times. Leonardo da Vinci Society - Information about the work of the society, which also publishes a newsletter. Leonardo da Vinci's Horse - The press release, and more, of the unveiling of "Leonardo's horse" in Milan in 1999. Leonardomilano.org - A virtual walk through Milan highlighting Leonardo's works in the city and other places of interest. In Italian. Madonna of the Yarnwinder - Hyper-spectral scanner analysis - A page from the Istituto di Fisica Applicata "Nello Carrara", Florence. By clicking anywhere on the painting one can obtain the spectrum of that particular point. Mona Lisa - Musée du Louvre - An excellent interactive resource that takes a closer look at the Mona Lisa revealing the secrets behind her smile. Mona Lisa: 3D examination - Background information, images and animations on the most important scientific study carried out on the Mona Lisa. Museo della Scienza, Milan - A wide range of images of models of Leonardo’s machines and inventions as well as information about his life, manuscripts and web links. Museo della Storia della Scienza, Florence - An online exhibit of Leonardo in the context of Renaissance engineering. There is a wide selection of images of models of inventions, manuscripts and animations of machines. Museo Leonardiano di Vinci - A virtual tour of the museum’s three floors populated with models of Leonardo’s machines and images of manuscript pages. The museum’s Library keeps a record of everything that has been published on Leonardo all over the world. Museum of Science, Boston - A great educational resource on Leonardo including interactive activities, lesson plans, videos of the building of the exhibition, and background information on Leonardo’s work. The Codex Leicester - A thematic exploration of the Codex Leicester, with detailed references and quotes from the manuscript. 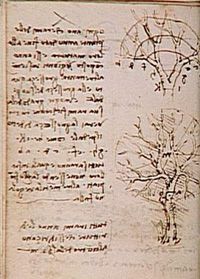 The Notebooks of Leonardo da Vinci - Full text of The Notebooks of Leonardo da Vinci, 2 vols, translated by Jean Paul Richter, 1888, made available on the web by the Project Gutenberg. Wikipedia: Leonardo da Vinci - The Wikipedia entry on Leonardo discusses his life and works, provides bibliographical references, a list of useful web sites as well as images.